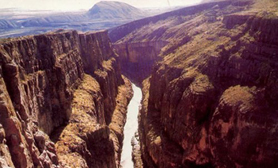 The largest river in the state is Rio Conchos which is the largest tributary to the Rio Grande from the Mexican side; the river descends from the zenith of the Sierra Madre Occidental in the southwest part of the state and winds through the center of the state where the water is exploited in the steppe zone and it eventually empties into the Rio Grande in the small desert town of Ojinaga. The desert area also accounts for about a third of the state’s surface area. The Chihuahuan Desert is an international biome that also extends into the neighboring Mexican state of Coahuila and into the US states of Texas and New Mexico. The desert zone is mainly of flat topography with some small mountain ranges that run north to south. 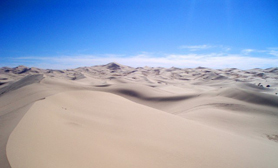 The desert in the state varies slightly with a small variant in climate. 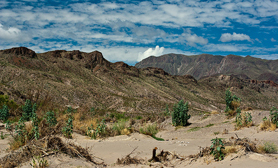 The lower elevations of the desert zone are found in the north along the Rio Grande which experience hotter temperatures in the summer and winter while the southern portion of the desert zone experiences cooler temperatures due to its higher elevation. Better known as the Samalayuca dunes they cover an area of about 150 square kilometers; it is an impressive site of the Chihuahuan Desert and is a protected area by the state due to unique species of plants and animals that can only be found in that area. The climate in the state depends mainly in the elevation of the terrain. 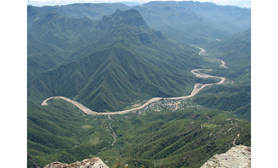 The Sierra Madre Occidental dominates the western part of the state; there are two main climates in this area: Subtropical Highland and Humid Subtropical. There are some microclimates in the state due to the varying topology mostly found in the western side of the state. The two best known microclimates are: Tropical savanna climate in deep canyons located in the extreme southern part of the state; Continental Mediterranean climate in the extremely high elevations of the Sierra Madre Occidental. Vegetation is much greener in the west because of the cooler temperatures and larger amounts of precipitation as compared to the rest of the state.